I'll bet you thought I forgot all about my weekly Party of Three shots, right? 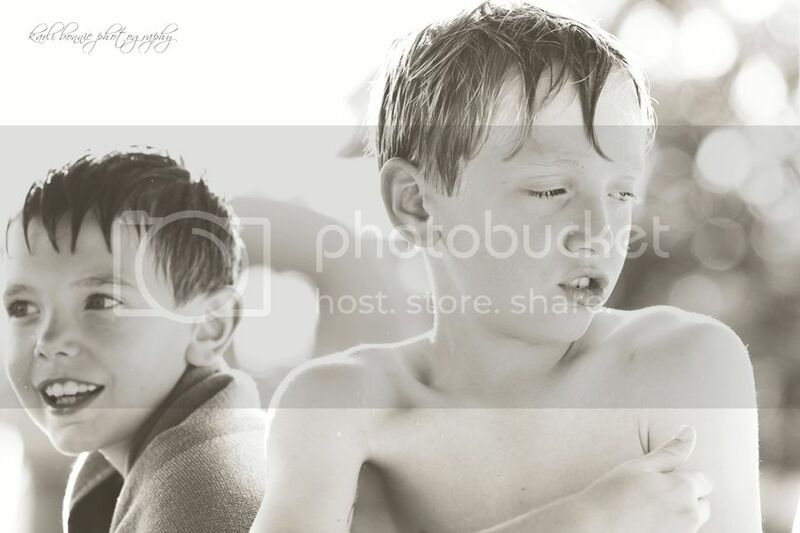 I remember saying that when summer came, it would be much easier to get shots of my kids together. Um, WRONG. 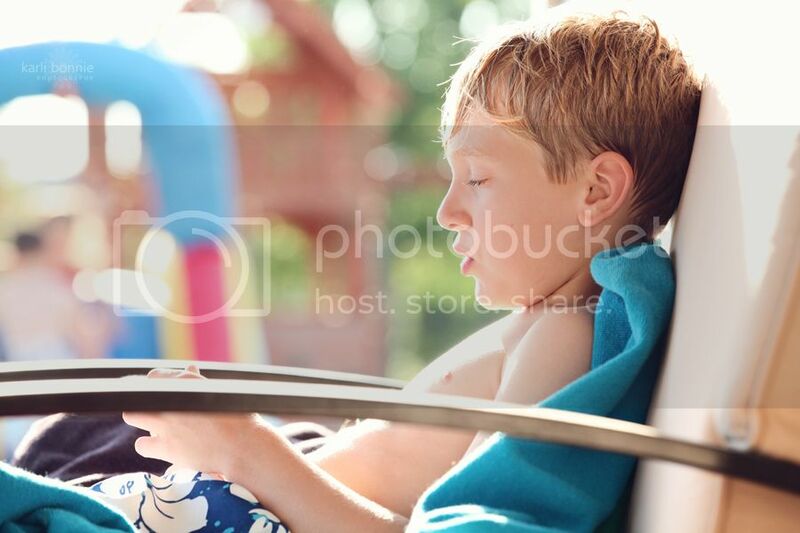 When your kids play every sport known to mankind, the practice and game schedules can get a little hectic. Lately we've had baseball games last until 10:00pm. We're leaving for vacation (and I'm supposed to be packing), so I'm going to make this a quick one. I feel like these photos are a step back from where I'm trying to go with my photography, but I came ready with an excuse: From the very first shot I noticed my camera battery was dying, so I didn't get a chance to snap all the "little details" like I'd planned. Some of these shots are a little snapshot-y, and I would have liked to put more thought into it. My run baby, run post is more the style of photography I'd like to work on. But anyway, here we go! Here's my picture for week 26. TT started out slow on the small water slide. The big slide looked a little daunting, even for a tiny tornado. But there's always a brother to help. I love the relationship between these two. They always build each other up...never put each other down. But let's be real. This isn't quilting club. They are brothers after all. OK, so there you have it...my kids at week 26. Thanks to everyone who left such sweet comments on my pictures this week. I'll be away from the computer for a while, so I'll catch up with you all when we get back. Off to the cabin! Awesome shots!! I just love your work!! Have a great vacation! 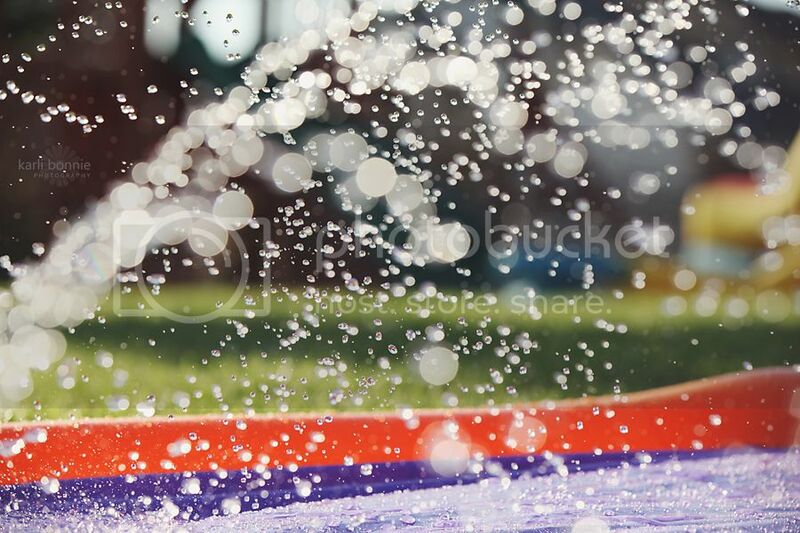 These sprinkler/ water shots are really great! 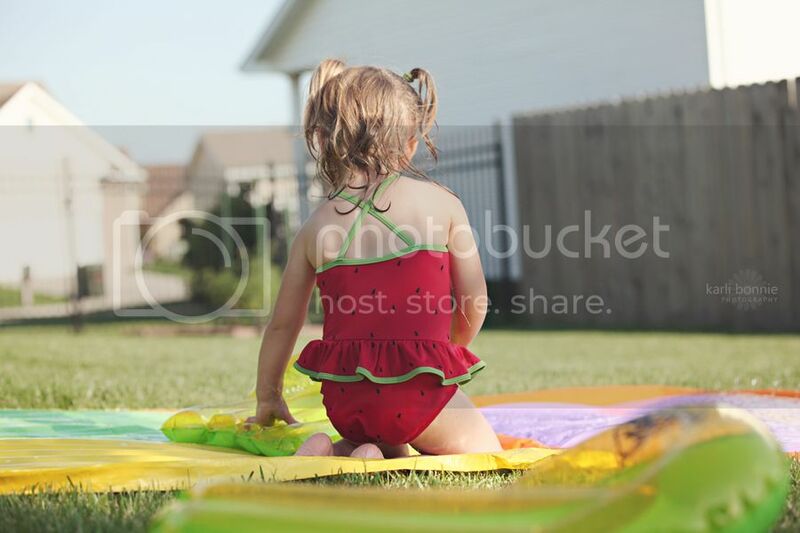 Cute little watermelon swimsuit... I like all the bright colors. I think many of these came out great. I love where you are headig with your photography. The shots of TT hands in the sprinkler - are awesome. Drew and Collin alone are very touching! Happy Birthday to you and your handsome son! Enjoy the cabin! I just absolutely love these shots! They are awesome! I love seeing TT in her swimming suit you debated over a couple of months ago! I love seeing the water shots, and I love the end shot! You just blow me away with your talent!!!! You are amazing! Have the most fabulous time at your cabin! So cute. I don't know how you do it. I have a hard time getting good pictures of just Carter weekly. I think 3 would be too much!! 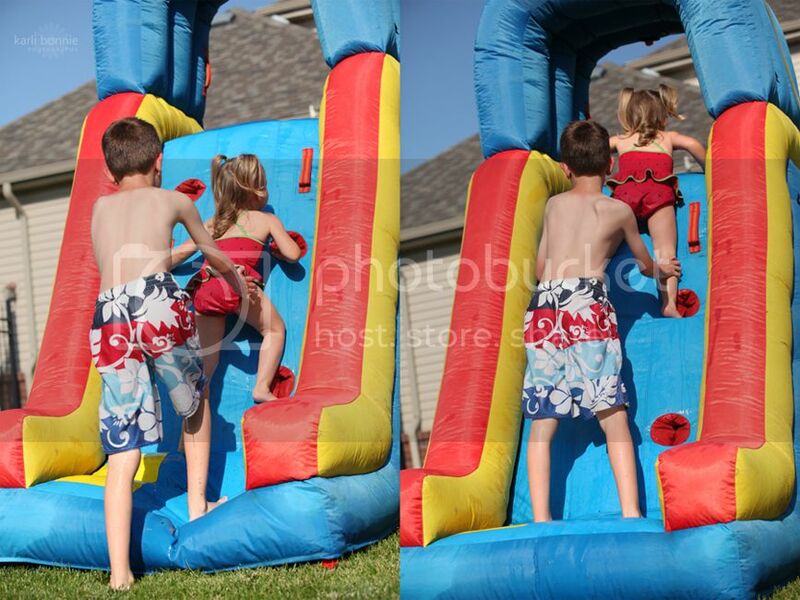 I would love to see Livia's face going down the slide. I bet I have a similar pic of Carter with a similar face!! 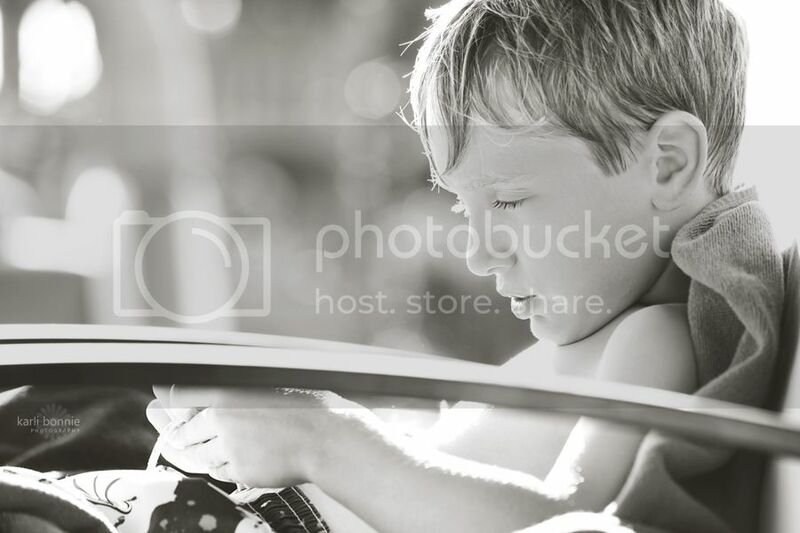 Love the shots - and love the water bokeh! That last shot was hilarious with THE END right next to it. Have fun on vacation! Maybe they aren't what you want but I love them. 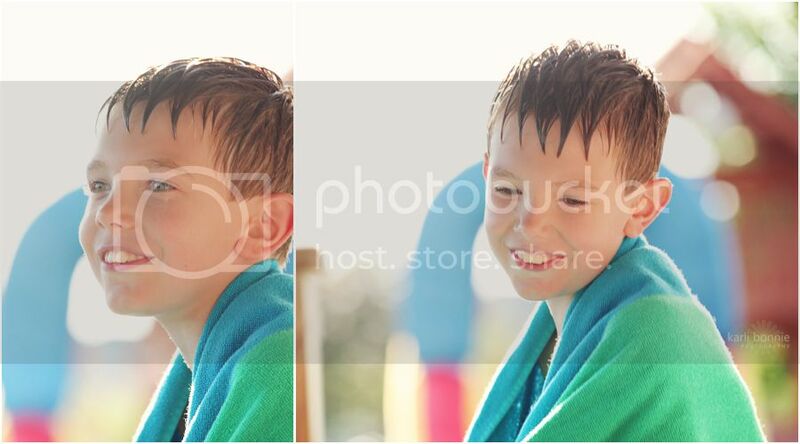 The shot of Collin with the water drops around him is my favorite! This post made me smile. Your kids made me smile. Such a great little family you have. Loved all the shots. Have fun this weekend. Sure there are a few snapshots but you're still rocking that style that I love. I think these are WONDERFUL! 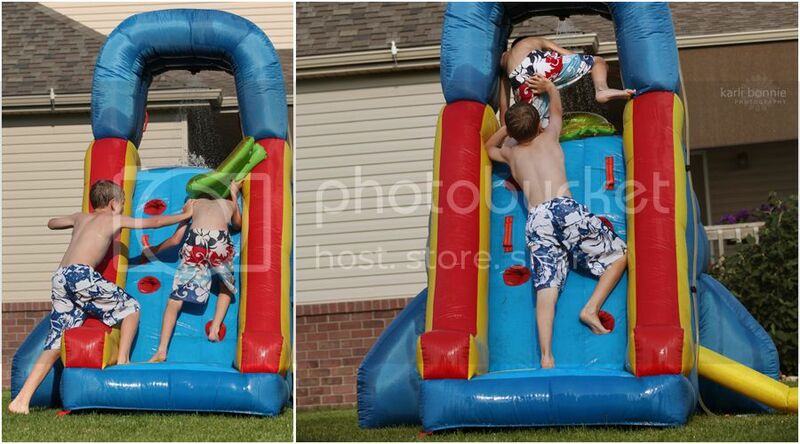 Great captures of fun times. So Much fun!!! Have fun at the cabin. Happy Birthday to your son!!!! Have a great vacation. I love your style and I love these. Happy birthday Drew! 15 years from now you are going to love looking back over these posts. Very nice. As always, fantastic shots! 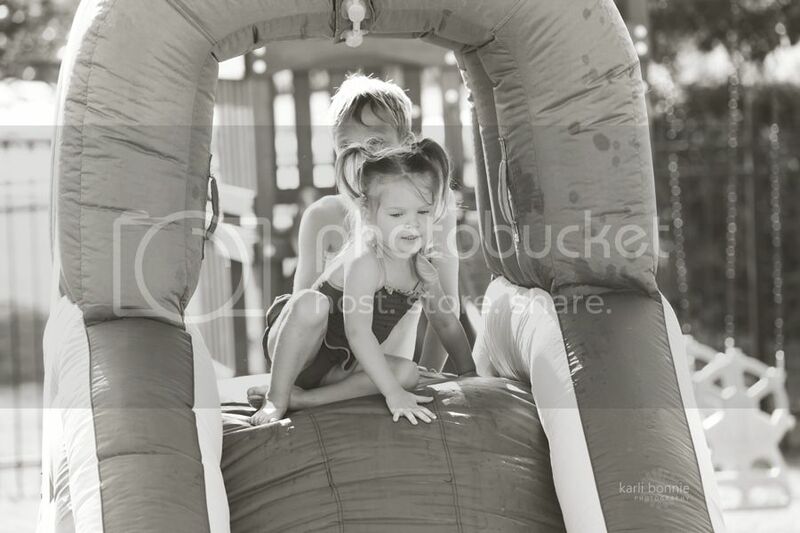 I always love the shots of all your children together because it is so obvious how much they love each other and how much fun they have together! Happy Birthday to Drew a little late! Wow, wow, wow!! I love these photos. AMAZING!! Looks like so much fun. GREAT shots as always. 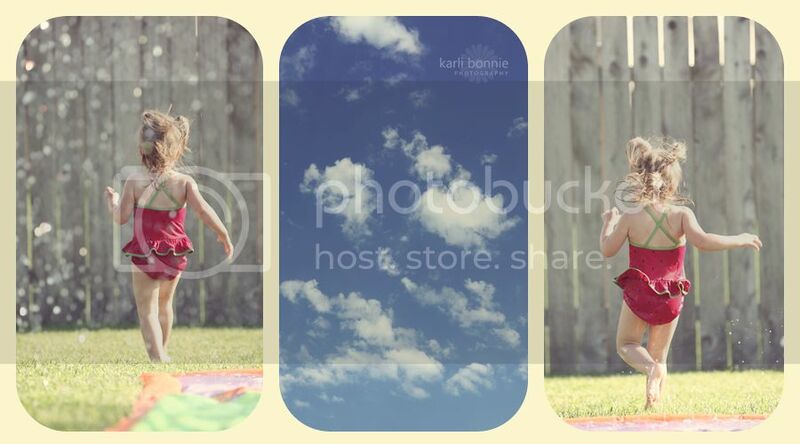 Love the triptych w/ the clouds.I love her little watermelon suit. Very cute! "Not quilting club".. XD That's hilarious!! 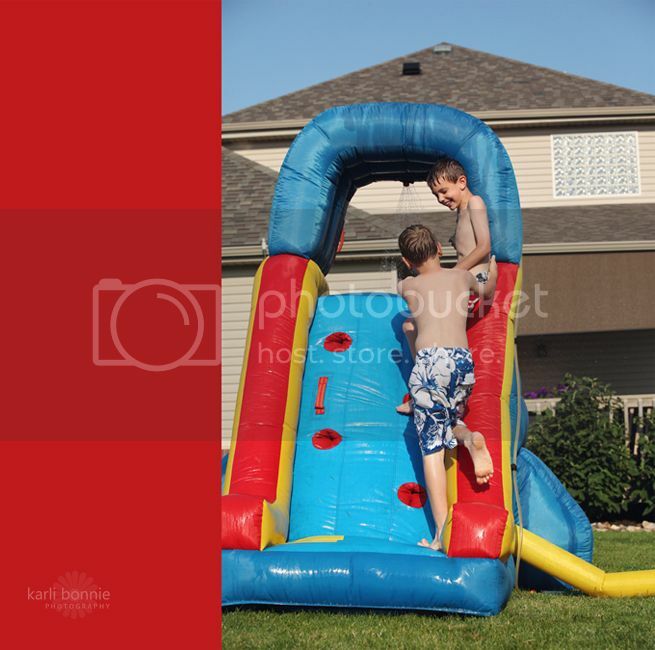 the waterslide so much fun, your children seem to have a wonderful friendship and relationship between them. Anyway, hope your still enjoying your vacation! And I don't know what you're talking about -- there's so many awesome shots here -- I'm loving the perspectives (getting the bottom halves or the back view instead of always faces) and the bright summery colors! Even with missing the details you wanted to capture, I think you captured some awesome ones already.. and the summer's still early -- you can try again... although I'd recommend either purchasing a spare battery (that you keep charged) or you charge your battery the night before! ha! btw, speaking of detail shots, I'm loving that 2nd to last one -- and am rather jealous... love the bokeh and the rainbow (did you see it!?!?) and the colors... and curious minds want to know... how??? lol! 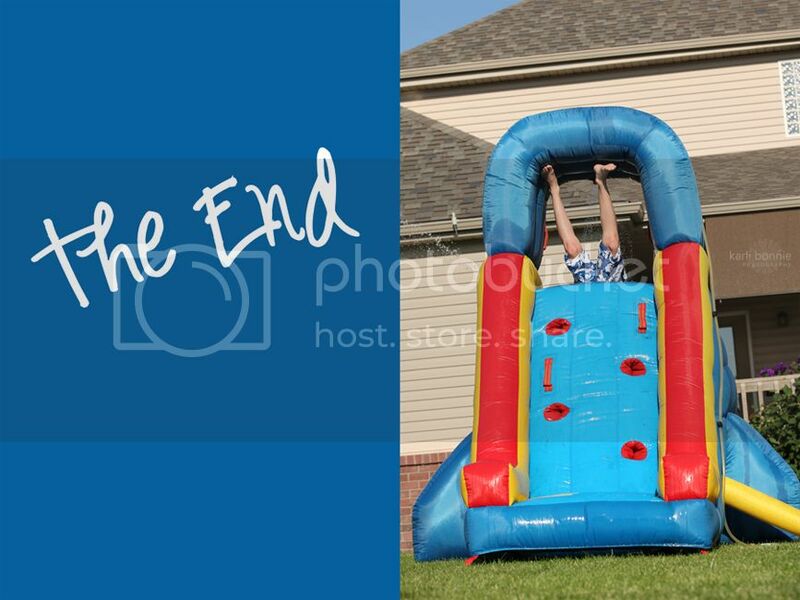 oh, love the "the end" shot too! ha! P.S. Happy late birthday, Drew!!! Ohh wow! I know I've been out of the loop for a while, but look how big TT has gotten! And all that long hair?? Sooo cute! 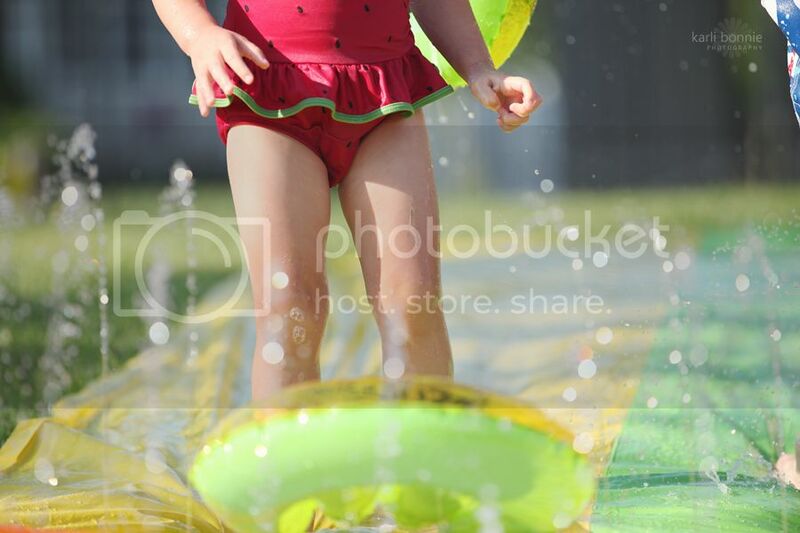 Beautiful photos as always Karli <3 Especially love that water and bokeh. Hope all is well with you! Holy mackerel! Happy belated birthday to Drew! And these shots are great! I love the fearlessness of TT! But you get that way being the only girly in two brothers right?! HEHE! 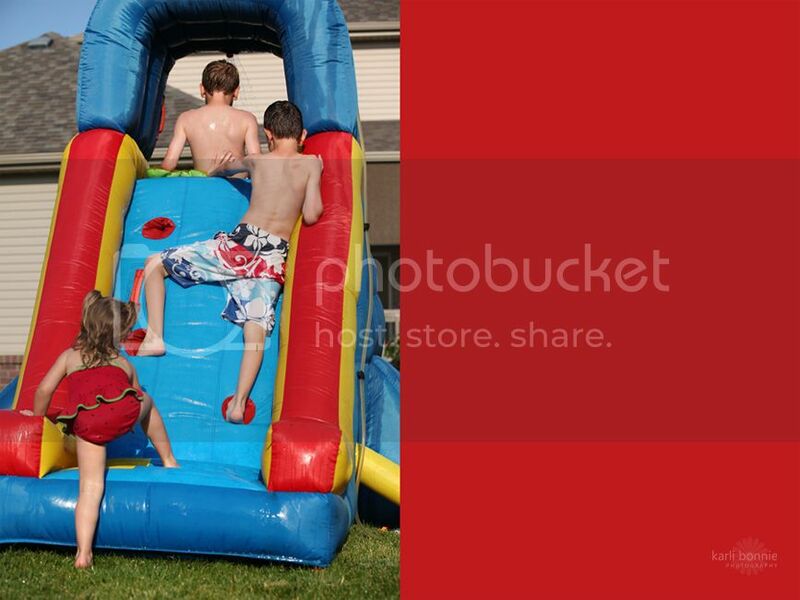 I also love that slide period, my little boy would have a ball but his short little legs probably couldn't climb it yet! Anyhow hope you are enjoying/have enjoyed your vacation~! I LOVE your 2nd to last shot. These are all amazing! You capture them so well and it looks like a fantastic time too!!!! I seriously love the bokeh its fantastic!! Now I must produce a photo as amazing as that ;-)! 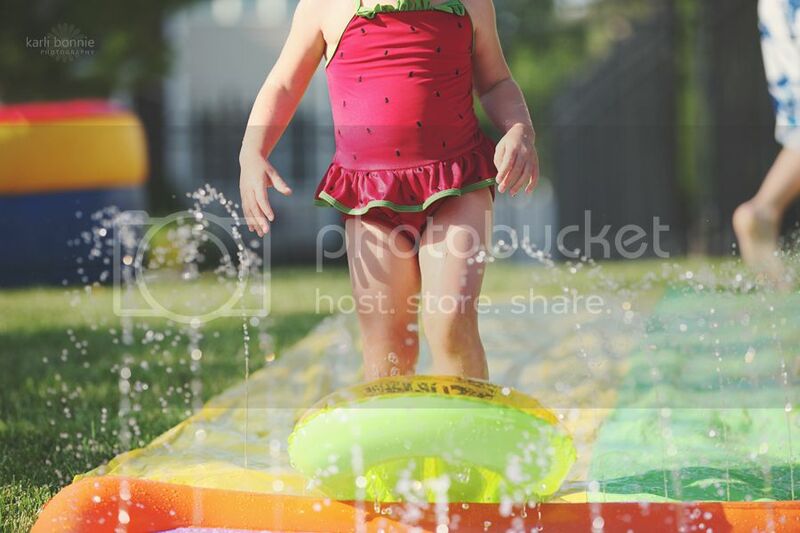 loved these fun water shots!! 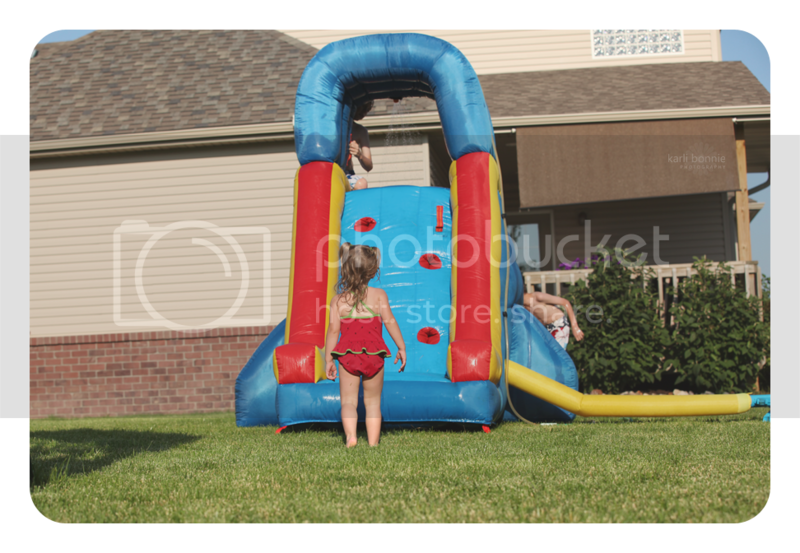 Such a neat water slide blow up thing and the kids all seem to be so awesome together when they play, rough housing and all;0. Looks like a great day outside!